Linda Čihařová (1982), žije a pracuje v Praze, kde také vystudovala Vysokou školu Uměleckoprůmyslovou. Absolvovala stáže na Famu, University of New Mexico v Albuquerque, Academy Beeldene Kunste v Maastrichtu a stipendijní pobyt v centru Egona Schieleho v Českém Krumlově. I když má její tvorba široké rozpětí a kombinuje nová média s klasickými, jednotícím prvkem a hlavním inspiračním zdrojem zůstává krajina a vzájemné vazby s jejími obyvateli. Vychází z land artu a konceptu, ale inspirují ji hlavně vědecké metody a výzkum přírodních procesů. Její práce má svébytnou polohu tlumočníka mezi lidmi a přírodou. Od roku 2008 se také věnuje designu z recyklovaných materiálů (zejména elektroodpadu v projektu Trash made). *Výstava Nanoscope, 2009: spolupráce: Fakulta chemicko – technologicá v Pardubicích, Andrea Kalendová, PhD. *Festival Enter, 2007: spolupráce: institut Mikrobiologie – laboratoře bioinformatiky na AVČR, Ing. Jiří Vohradský Ph.D.
Linda Čihařová has born on 2.7.1982 in Prague, where she is also living and working. She graduated at the University of Art, Archuitecture and design in Prague and also experienced film studies on FAMU in Prague, University of New Mexico in Albuquerque and Academy Beeldene Kunste in Maastricht, Netherlands. 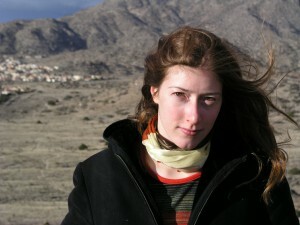 Although Linda Čihařová is in a way an multi-instrumentalist of new media, almost all her projects have base in land art and concept art. Unifying element and main inspiration source she almost always finds in landscape and science. Her works are a special kind of language, used for communication between nature and human minds. Since 2008 she also works with recycled materials (especialy from electrowaste) as designer for Trash made project. In my work, I am trying to transfer the way I see things. The smallest parts of the nature, the invisible creatures whispering words of survival or just having their own lives, where humans are not that much important. The very theme I found interesting is the place where we meet with the nature. How we react to our surrounding and how it reacts to us. How the way of our perception created the environment we are now surrounded by? My aim is not to scientifically understand the system of living beings, but to feel them and pass this emotional information on. My works are mostly related to environment, natural powers, scientific studies or systems. Applying one system on the other helps me to find interesting features and new points of view. * Nanoscope, 2009 – cooperation: University of Pardubice, Andrea Kalendová, PhD. *Festival Enter, 2007 – cooperation: Laboratory of Bioinformatics, Institute of Microbiology AS CR, Ing. Jiří Vohradský Ph.D.